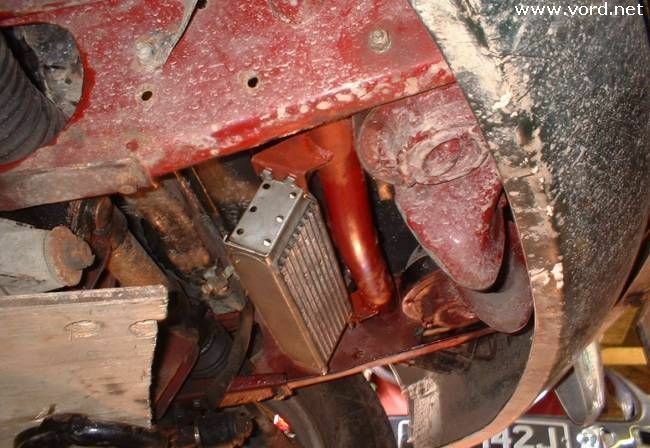 The problems with my MGA cooling system were bought home to me during a trip to the Alps in 2003. The MGA overheated in Bruxelles traffic despite the outside temperature being below freezing. People drive MGAs around Texas with fewer problems so I decided I must be doing something wrong. The car is fitted with a 1950cc Oselli engine with a quoted 125bhp so will produce more heat than the original. 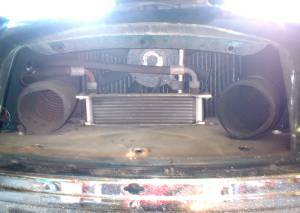 Having said that, my MGB V8 has twice the power again and no cooling problems so there should be no excuse for problems with the MGA. 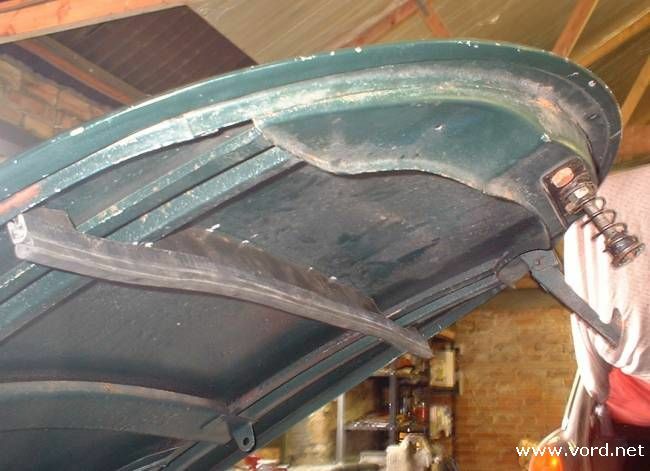 My car has always lacked the foam pad that is supposed to be glued to the bonnet to block the gap above the radiator and prevent hot air from the engine bay re-circulating through the radiator when stationary. Not having any foam to hand I made a steel baffle and screwed it to the bonnet rails, then attached a seal from a wheel arch baffle. 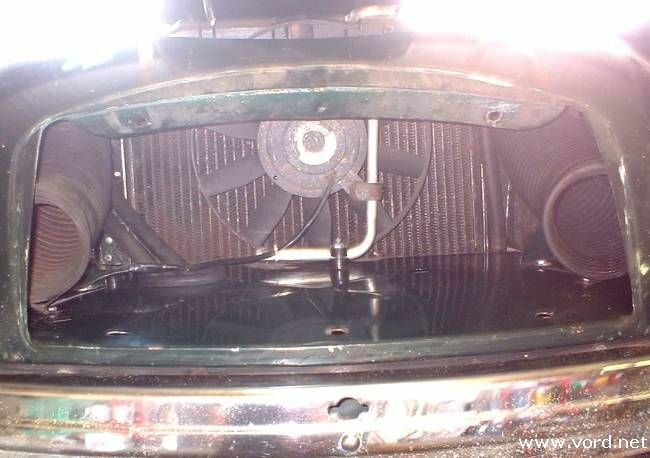 Recirculation of hot air through the radiator is major cause of overheating - you just need to look at modern cars to see the effort that goes into preventing this. It's much better to send cool air through the radiator. It was a holiday weekend and I had plenty of time so I decided to go further. Peering through the grill I found I could not see the radiator due to a mass of ducting hoses, an oil cooler, and wide bodied electric fan motor. My original installation is not original. It's not even well thought out and I'm a little embarrassed to put a photograph on this site. The effect is similar to blanking off half the radiator grille. The oil cooler was the first thing to go. I moved it to beneath the radiator panel. The angle is largely due to the hose routings. 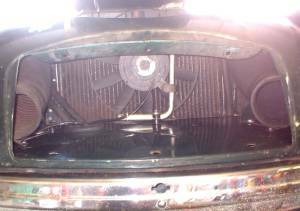 My feeling is there should be turbulence down there while the car is in motion, so the oil cooler should work a bit. If I start getting worried about oil temperature in the future I can always cut some holes in the valance and duct air to the cooler. With the oil cooler out of the way I moved the ducting hoses outboard to reduce their obstruction to radiator air flow. Apart from the electric fan the view to the radiator is much less obstructed. I did some air flow tests by heating the engine up until the fan started, then released small pieces of tissue paper to see the direction of the air flow. Unfortunately it seems the radiator fan pushes air through the radiator, the air goes sideways, and back through the radiator, then gets pushed into the radiator by the fan again. Hot air going round and round won't help the cooling. The answer will be to fit twin 9 inch fans similar to the MGB V8 system, which should reduce the chance of recirculation. I went out for a short test drive and the difference is noticeable. The water temperature when driving normally is slightly less than halfway around the gauge, but more importantly, at idle the cooling fan will cut in, cool the water, then cut out again. Previously the temperature would have risen to the point of overheating and fuel vaporisation. I have yet to try the car on a very hot day. Hopefully it will be OK.
Update: Cooling around town is fine now - even when temperatures are 30 degrees C - but I still have a problem with motorway driving in hot weather at sustained high engine speeds (above 4000rpm). I'll have to do some more thinking..... (probably involving deciding exactly which bits of body to remove to facilitate decent air extraction from the engine bay).